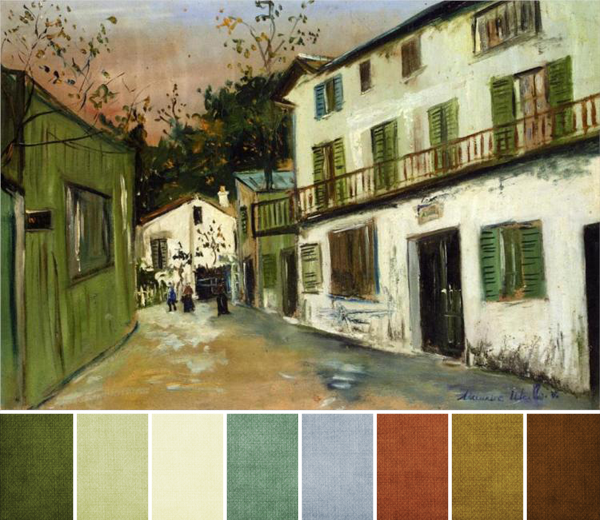 I'm absolutely loving the colors from this month's challenge artwork from Maurice Utrillo. The tones work together beautifully, and are perfect picks for a spring/summer palette. It's colorful without being overwhelming, and not what I'd immediately choose for a transitional palette - but it absolutely works to carry us through to summer, don't you think? I'm particularly loving the greens I see - pale sages, medium grass greens, and dark forest greens - mixed with the golden tones sprinkled throughout. I think green is such a forgiving color and can work no matter the time of year. The touches of periwinkle, terracotta, and warm brown really keeps the feeling of the painting on the warmer side. As you're putting together your challenge piece for this month, you can keep things nice and airy by using the lighter tones of the painting. Or you can add in some black, a deep rich cobalt blue, or a very dark green for a grounding effect, if the mood strikes. What colors do you see? What colors are you planning to use? Visit Brandi Girl Blog for more color inspiration. This color palette is so gorgeous, I can't wait to get started! Yay! Until you pointed it out, I really didn't see the pretty salmon color melting in the sky. I think that I will be trying my hand at this challenge this month and I will try to do some sort of gradation perhaps. I do like that sunset color so much! What a great painting with so many colors to choose from! Love this! I haven't ever participated in a challenge but this palette is so gorgeous I'm going to have to give it a go. This really got my juices flowing in a way that hasn't happened in a while.